and then click the "Buy Now" button above. Download Sage 50c Quantum Accounting 2018 Now! Sage 50c Quantum combines the power and productivity of a desktop solution with secure online access. You are free to run your business more efficiently with a time-saving solution to manage your accounting, invoicing, cash-flow, inventory, taxes, and much more. Get one hour of training FREE when you buy your Sage 50c Quantum Accounting software from CBA. A Certified Sage Intelligence Consultant from CBA will show you how to create your own personalized reports using Sage 50c Intelligence Reporting. Sage 50c Quantum Accounting is more than business accounting software � it's a business management solution. 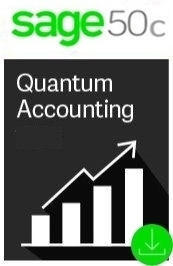 Quantum Accounting gives you the ease of use of an out-of-the-box solution at an affordable price. With Quantum you can monitor and manage every aspect of your business all in one centralized system. More than just an accounting program, it also helps you manage your customers, vendors, and employees, your inventory, services, and jobs, and more. Sage and Microsoft have partnered to bring you the best accounting solution with seamlessintegration with Microsoft Office 365 and the cloud to give your businesses the best flexibilityin how you work. Sage 50c with Office 365 now allows our customers to meet all of their business and accounting needs in one complete solution. Sage Contact � Automated contact sync of Outlook 365 and Sage 50c contacts, you will never have to wast time manually importing your contacts. Automatic Cloud Back-Up - Get the security and peace of mind knowing your data is always backed-up in the cloud. Microsoft Office Business Premium � Get cloud access to all the Office 365 program suite including Word, Excel, Skype,OneDrive and much more! Don�t pay thousands of dollars more for functionality you may not need or use. With other mid-market solutions, you pay more for implementation, training, and maintenance. Built to accommodate large data requirements, including faster processing with SmartPosting Technology. Support for up 40 users1 with advanced user security settings. Sage 50c Intelligence Reporting, Financial Management, Workflow Management, Workflow Automation, Interactive Job Reporting, Advanced Budgeting, industry specific features � these are just some of the in-product tools that will help drive your business to success. Sage 50c Quantum Accounting includes many analytical tools so you can make more informed decisions and make them faster. Use the Cash Flow Manager and Collections Manager to ensure the financial health of your company. Use more than 140 customizable reports to identify trouble spots, trends, and opportunities. The Internal Accounting Review2 lets you run up to 16 audit checks on your data to identify any potential errors. Monitor individual users with Audit Trails - Deter fraud by tracking every users' entries, changes, and transactions. Sage 50c Quantum Accounting provides all your core accounting needs � plus, it incorporates functional and collaborative tools and features that help you run your operation more efficiently. Order process workflow � From one centralized place, easily track all the moving parts of your order process, so nothing gets missed and everything works as planned. Ensure that critical process-driven activities are sent to the right person at the right time. Give your staff the ability to quickly view and add transaction status details for easier tracking of customer or vendor orders. Notify the next person in the process with a status and specific notes as needed. Automatically send notifications to designated employees, customers, or vendors once a task is completed. Centralized management centers � Sage 50c Quantum Accounting is your one-stop shop for managing each customer, inventory item, service item, or job. Get the details quickly with customizable dashboard views and highlight the information you need to better serve your customers, as well as make more informed, more profitable business decisions. Each user can create customized dashboards to organize key, real-time information and access it easily. View relevant tasks and filter data based on how you need to track it. Customize your Sage 50c Quantum Accounting screens to show personalized information on My Dashboard with 46 modules to choose from. My Dashboard�s birds-eye view and easy access to real-time tasks and information empower your teams to manage their own work more efficiently. Additionally, all users have their own personalized Inbox to help get organized and stay focused on their individual tasks. The latest version of Sage 50c Quantum Accounting with updates for as long as you're enrolled. Unlimited5 access to technical support analysts by phone, email, and online chat for your Sage 50c solution. The advice you need, with access to Sage Small Business Webcast Series. All of these benefits are part of your auto-renewing Sage Business Care plan and are included as part of your product purchase. 1 Multiuser licenses available in packs of 1 - 10, 15, 20, 30, or 40. A maximum of 40 licensed, named users is allowed. Only the first 40 named users selected in the user maintenance screen are considered licensed, named users. 2 Sage is not liable or responsible for any fines or penalties that may result from errors in your company accounting records. The Internal Accounting Review is not intended to uncover all questionable transactions. 3 Sage 50c does not impose a hard limit on database capacity, however, individual performance will vary depending on actual number of transactions, database size, and number of concurrent users. Data management efficiencies are also realized in the Sage 50c Accounting 2018 products. 4 Valid credit card required to activate service. To ensure continuous service, your Sage Business Care plan is an automatically renewing plan, and subsequent years will be automatically billed to the same credit card each year on the anniversary date of your purchase at the then-current rate after notifying you 30 days in advance of your anniversary date. The credit card provided with this purchase will be used to automatically renew the plan if there is no other credit card number already established as your standard credit card number on file with Sage. You may terminate the plan with at least seven calendar days� notice prior to your renewal date and not be charged for the renewal. 5 Customer support analysts are available from 9:00 a.m. until 8:00 p.m. ET Monday-Friday, and reserve the right to limit calls to one hour or one incident. Assistance is limited to Sage 50c solutions.